Removed Banksy Mural Restored and…? Scott M. Haskins, Art Conservator (center) positions redwood slats of removed Banksy mural as he consults with Paul Schurch, Master Woodworker on a plan for mounting the mural to an aluminum honeycomb panel. 18 Responses to Removed Banksy Mural Restored and…? Yes, you are right! We’ve been in the news a lot lately. Our OC article was about the art conservation work of the huge Spanish Colonial main painting in the main chapel of the Mission San Juan Capistrano. Yes! I was super jazzed. Incredible coverage with front page on the Sunday paper! I’m not sure what the arrangements were for the repair of the building. I suspect that Brian Greif agreed to repair the building flawlessly and that it was done immediately. But the artist is internationally known and the artwork was (is) valued well into the 7 figures. Stay tuned… its only going to get more interesting! I love street art and public murals. That’s an ongoing discussion. Last year at the Museum of Contemporary Art in LA they had an exhibition on street art that failed to educate and differentiate between graffiti and street art. I saw the exhibition as a failure, educationally. In my country we have not so much problems with graffiti. But it seem a cool thing to have interesting art on walls in public. Cudos on getting this work. Its cool to be able to follow this project on this blog. So, what happened to the side of the building where the redwood slats we cut off! That seems like a big deal to repair. Is this “art” really worth it? I saw your article in the SF Chronicle. Good coverage. Congrats! I also saw your article in the paper. Great article. Way to get the word out. I saw this in the SF Chronicle. What great overage. Is this the same art conservation person that I saw the other evening on the Kardasians?! I saw your name, Mr. Haskins in the OC Register. You guys are making the news lately! Street art is so cool and I love how it takes are to the public. Thanks for being a part of the solution of preserving it. 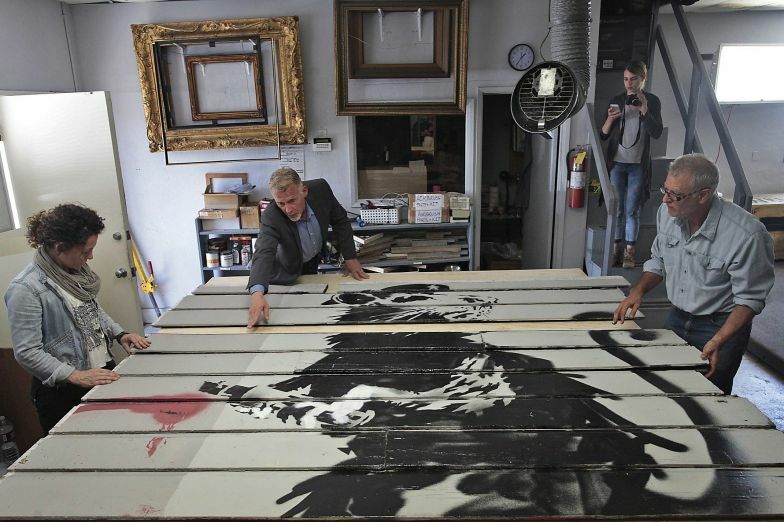 Banksy is my favorite contemporary artist and its so cool to see his art preserved and restored.